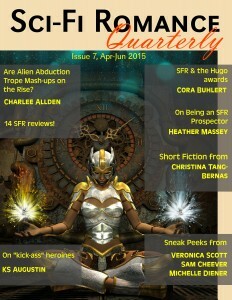 Sci-Fi Romance Quarterly: Issue Seven Now Available! Issue Seven has been released, and at nearly one hundred pages, is a bumper issue. As always, it’s FREE. This issue contains reviews, a lively editorial, new releases, opinion pieces, and an original short story. The issue can be read on your computer or can be downloaded in pdf, mobi, and epub formats. There’s also a beautiful flipmag. Get your copy HERE. And don’t forget we have six other issues for your reading pleasure. This entry was posted in Science Fiction and Science Fiction Romance and tagged science fiction, science fiction romance, SciFi Romance Quarterly, SciFiRom, SFR. Bookmark the permalink.